Pulau Pangkor - Pangkor Island, a gem in the Straits of Malacca. I took my family for a day-trip to Pulau Pangkor a few months ago. The Swiss Garden Golf Resort & Spa Damai Laut, which is situated on the mainland facing the island of Pangkor, was running one of its periodic room promotions. The were offering two nights stay for 2 adults and 2 children, including breakfast, for less than RM600 which I felt was a good deal for a hotel of this standard. From the hotel we drove for about 30 minutes to Lumut town from where the Pangkor ferry departs. We left the car in a multi-storey car park near the jetty and had a quick look round the town. Lumut has a relaxing seaside resort feel to it. The ferry trip was smooth and uneventful and 30 minutes later we arrived at Pangkor town jetty. From there we took a pink minivan taxi to Teluk Nipah which is reputed to have the best beach on the island. The taxi driver charged me RM15. I could probably have negotiated a lower fare but I was feeling generous. The road to the beach passes through the quaint town then along the west coast lined with coconut groves. We spent a pleasant few hours relaxing on the fine white sandy beach and swimming in the clear warm sea. At the northern end of the beach there was a small Chinese temple and from there we scrambled over some rocks to a small secluded cove. It was mid week and low season so there were very few people around. If I have any criticism of Pangkor it is that many of the shops and restaurants were shuttered up (a common feature all over Malaysia). Perhaps they only open during the local school holidays when the island sees more of a rush of Malaysian visitors. We ate at a laid back beach side restaurant with chairs arranged on the sand (about the only one open!). It was pretty good and reasonably priced. The street alongside the beach was lined with a somewhat scruffy row of shops, stalls and accommodation. Considering that Teluk Nipah is such a beautiful location the accommodation is really quite humble. You find this in a lot in Malaysian beach resorts. I suppose it ensures that access to their best beaches remains affordable for ordinary Malaysians rather than converting them all into exclusive luxury resorts which is what happens in many other countries. And the basic buildings add to the quaint charm of the place. The atmosphere on Teluk Nipah was decidedly sleepy on the day of our visit and a flock of hornbills had made themselves at home in one of the abandoned stalls. Before catching the return ferry we had a look around Pangkor town (more an overgrown fishing village) and my wife took the opportunity to stock up with a supply of dried fish, including ikan bilis, the tiny dried anchovies which are an essential accompaniment to famous Malaysian dishes like nasi lemak. 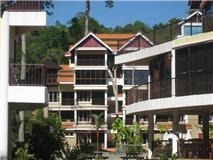 A full range of accommodation is available on Pulau Pangkor from basic low-budget hostel/hotels to high end resorts such as Pangkor Island Beach Resort which has its own beach on Belanga Bay. For those with money to burn there is the super luxury Pangkor Laut Resort, set on its own island with exclusive villas on stilts stretching out into the bay. If I were to visit Pulau Pangkor again I would probably opt for the Anjungan Beach Resort, a modern apartment-style, moderately priced resort in a prime location on Teluk Nipah. For something more special, Tiger Rock, a boutique guest house, is, I am told, well worth considering. It takes around 3 - 4 hours to get to Lumut by car from KL. Somewhere in the vicinity of Lumut I managed to pick up a speeding ticket (I only found out about it recently) which was very annoying as I am normally such a careful and law abiding driver. When the RM150 fine is factored in, the Swiss-Garden package was not such good value after all! For more information on Pangkor Island I can recommend a great website called Pulau Pangkor.com written by an expert who lives next door to the island. Click here to view the website.